Regiment/Catrawd: Durham Light Infantry 1st/5th Bn. Ref No Grave or Memorial / Rhif cyfeirnod bedd: I. O. 7. John Owen Jones was born in Llannefydd, Denbighshire at the turn of the century. He was the only child of Robert and Elizabeth Ann Jones. They were Welsh speakers, both of whom came from the same area. 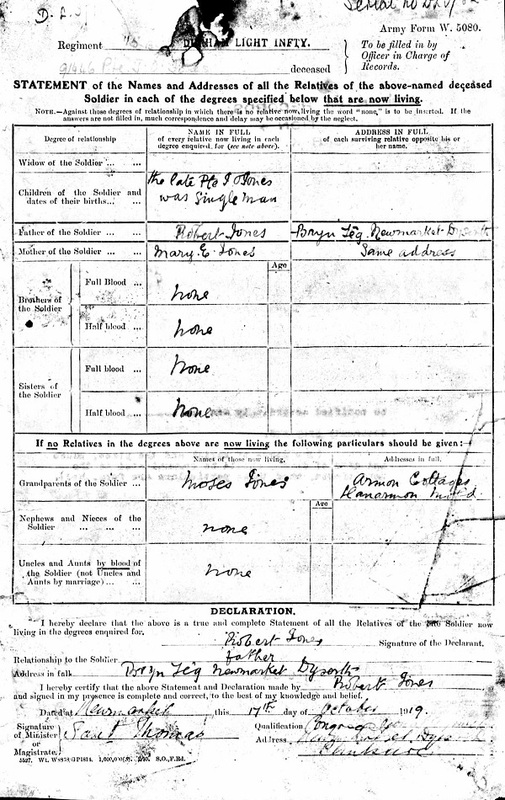 According to the census, in 1901 Robert was a minister with the Calvanistic Methodists and living in Llannefydd. By 1911 the family had moved to Trelawnyd (Newmarket) where Robert continued his ministry. John, aged 11, was at school. He was 18 when he joined up. Many of his service records have survived and can be accessed via Ancestry. 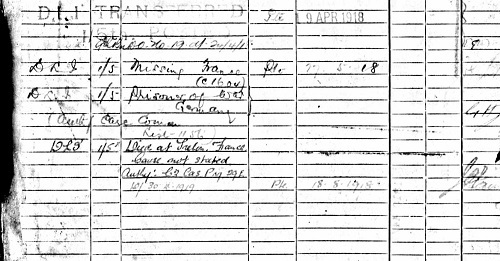 From these we know that he was employed as a shop assistant when he enlisted in October 1917. He was first recruited into the 5th Reserve Battalion, The King’s Liverpool Regiment. In February 1918 he was transferred to the 4th Reserve Battalion, Royal Welsh Fusiliers and in April of that year he was posted to France. There he was transferred again, this time to the Durham Light Infantry. A short time after, at the end of May, his battalion was reported missing in the field. This letter demonstrates the anxiety felt by his family who clearly had no idea of what had happened to him. 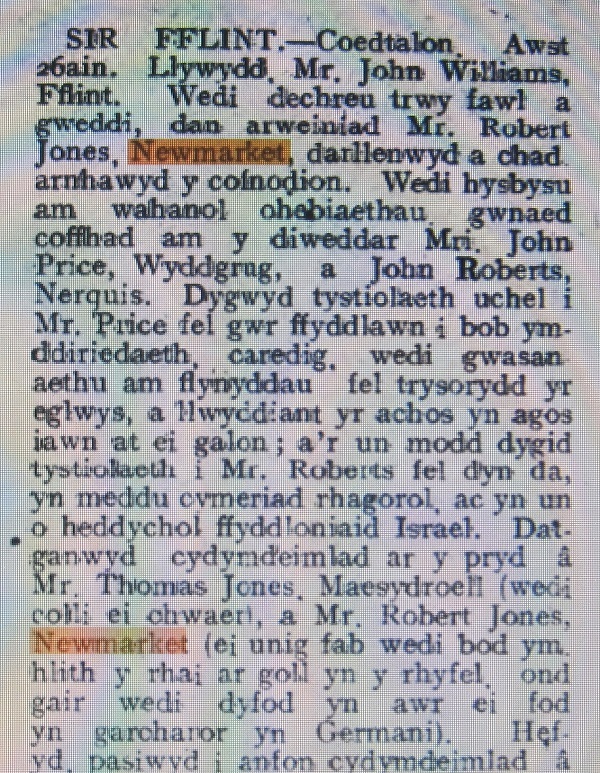 The newspaper account states that the meeting in Coedtalon began with worship and prayer after which Robert Jones, Newmarket, read out the notices. 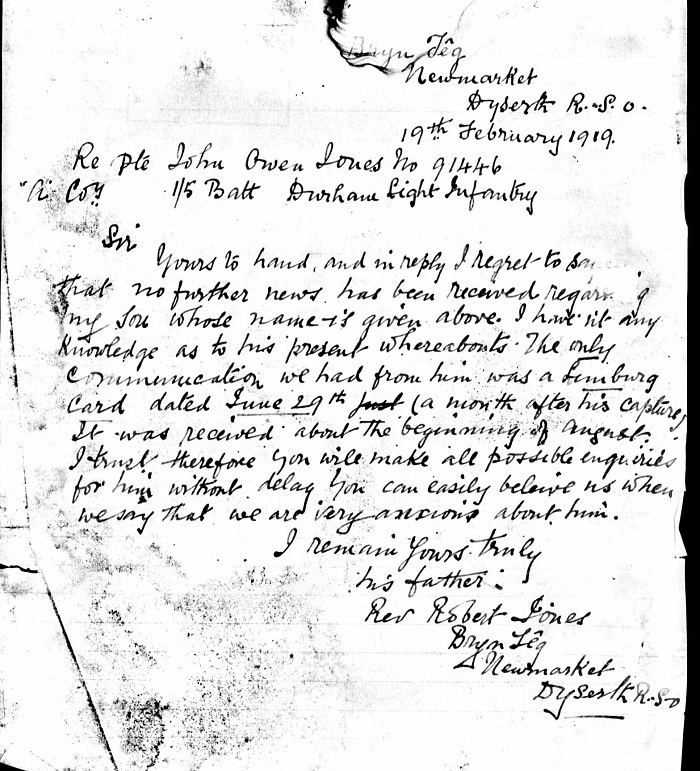 During the meeting sympathy was extended to Robert whose only son had been among those lost in the war but now word had reached him that he was a prisoner in Germany. Trelon, a village in Northern France, was behind German lines for most of the war. It was the site of a military hospital where prisoners of war were taken for treatment. 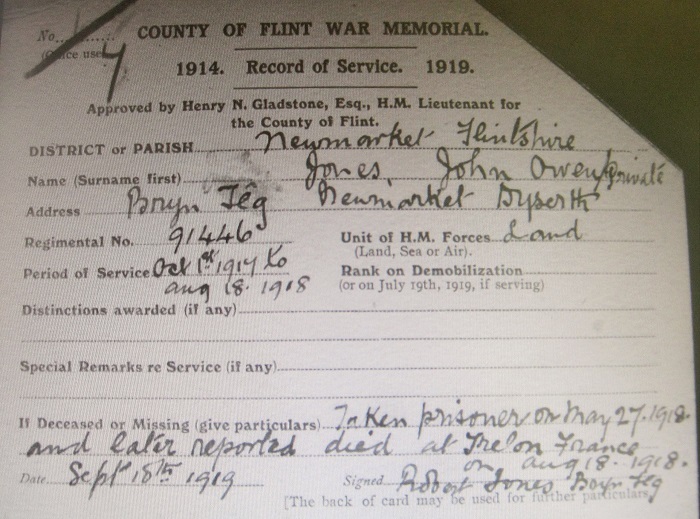 John was buried in Glageon Communal Cemetery Extension. We shall never know how his father and mother coped with their tragic loss. Let us hope that Robert’s faith empowered him to comfort others who had similarly suffered.